According to an exclusive MTV interview from April 22, the Prequel takes place in the year 2085, thirty years before Ellen Ripley is born. The film will feature the story of the famous Space Jockey, who appears in 1979's Alien as a corroded, eaten out husk of a former pilot of a derelict spaceship. With his ship overrun by the aliens of the franchise, the Space Jockey (an alien of another race - was he a Predator?) set his ship to send out a warning beacon: Stay Away. Stay Away. Stay Away. 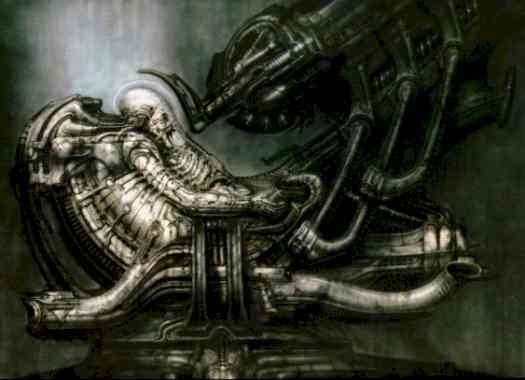 I'm an aspiring artist and a big fan of Mr. Giger's work, and was wondering if you could possibly give me some advice? Any help you could give me would be greatly appreciated, particularly if you could guide me as to what courses you feel would be of most benefit to me. Take whatever courses you find the most interesting. Study closely the work of the Old Masters. Stop making art that originates only from your own imagination. Stay with one technique until you perfect it. On any given day, always be in the middle of reading a book. When you finish one, start the next. Fiction, nonfiction, biographies, autobiographies, history, science, psychology, or how to build a kite. Anything but go easy on the comic books. Buy and read the first 6 pages of newspaper every day and also the editorial commentaries. Skip the entertainment section. Su Doku is fine. Do the crossword puzzle. Fill up a sketchbook every month with pen or pencil drawings of the world around you, not from your imagination. Buy a book on figure drawing. It's the only art book you will ever need. Until you can draw an accurate portrait of someone, you don’t know how to draw. Stay away from the airbrush. You'll never master it, hardly anyone ever has. Visit every museum in your city. Often, until you have seen everything in it. Every kind of museum. Not only the art museums but, of course, those as well. Forget about contemporary art by living artists, at least for the next few years. Stay away from most art galleries. Go to art auctions. That's where the real action is. Talk to you mother or father at least once a week. Do not watch television unless it’s the news or documentaries. Do not use an Ipod. Spend 8 hours in a hospital emergency room. Save up money so you can travel to a foreign country within the next five years. Vote in every election or never dare to utter a political opinion. You are not entitled to one. Buy a digital camera and take photos every day. If you see nothing interesting to photograph, you will never be a good artist. Keep only one photo of every ten you take. Delete the rest. It will force you to learn how to edit the garbage from your life, to make choices, to recognize what has real value and what is superficial. Visit an old age home. Listen to classical music and jazz. If you are unable to appreciate it at least as much as contemporary music, you lack the sensitivity to develop into an artist of any real depth. Go to the ballet. Classical or Modern, it doesn't matter. It will teach you to appreciate physical grace and the relationship between sound and movement. Wake up every morning no later than 8 AM, regardless of what time you went to sleep. Never explain your art. People who ask you to do so are idiots. Never explain yourself. Better yet, never do anything that will, later, require you to explain yourself or to say you're sorry. Stop aspiring and start doing. This will keep you very busy but it can't be helped. In my opinion, this is how you might, possibly, have a shot at becoming a good artist. 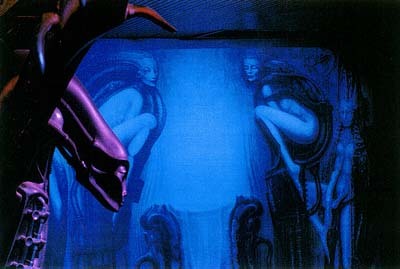 Below, hear the closing piece from the soundtrack of the first Alien film, an excerpt from Howard Hanson's Symphony No. 2, "Romantic". A great artist with their lots of designs those are amazing.